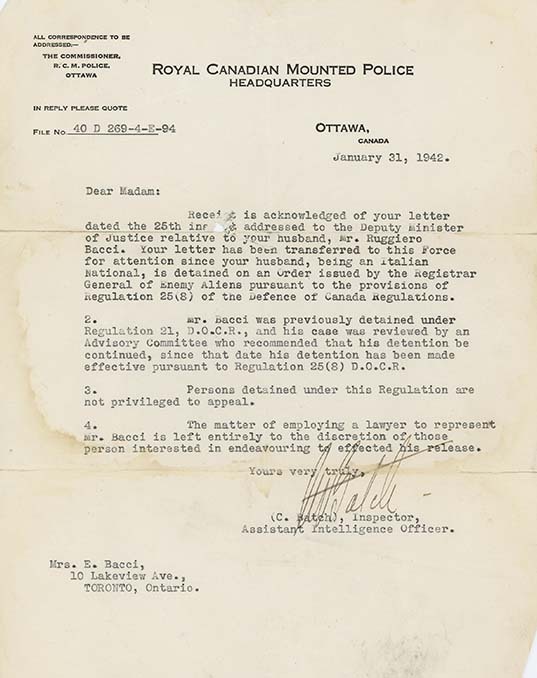 Letter from C. Batch (Inspector, Assistant Intelligence Officer, RCMP), to Mrs. E. Bacci, January 31, 1942. In this letter, the R.C.M.P. Inspector writes the wife of internee Ruggero Bacci. Originally detained under Regulation 21 of the Defence of Canada Regulations, Bacci is now held under Regulation 25(8). As a result, he apparently is "not privileged to appeal". Under Regulation 21, the Minister of Justice had the ability to intern any individual suspected of acting “in any manner prejudicial to the public safety or the safety of the state.” Under this regulation, habeas corpus – the need to produce evidence against an internee – and the right to a fair trial were suspended. However, after 30 days, internees could formally object to their detention to an advisory committee appointed by the Minister of Justice. The Minister of Justice then appointed a judge to review the internee’s case. This meant an examination of the RCMP’s evidence against the internee, meetings with the internee, and interviews with witnesses who could attest to the internee’s character. After this, the judge either recommended an internee’s release or continued internment to the Minister of Justice. Under Regulation 25, the Registrar General of Enemy Aliens, appointed by the Governor in Council, could also intern enemy aliens considered a threat to public safety and who refused to sign an undertaking. As a leading member of the Fascio Umberto Principe, Bacci was originally detained under Regulation 21. He did have a review of his case, and his detention was ordered continued by Justice J.D. Hyndman. It appears as an Italian national, he then fell under Regulation 25, and his internment was continued under this provision.